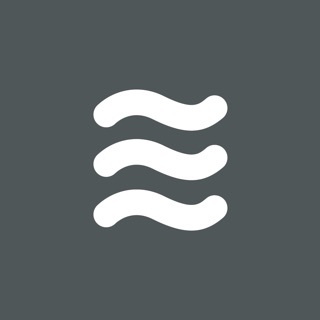 The team(Planner) app will revolutionize the way you and your teams collaborate and work together on projects. This is not just a simple task or todo list manager, this app is part priority manager, part project manager, and part task manager. team(Planner) is unique because it understands the difference between when something needs to be completed by, and when you’re going to work on it. 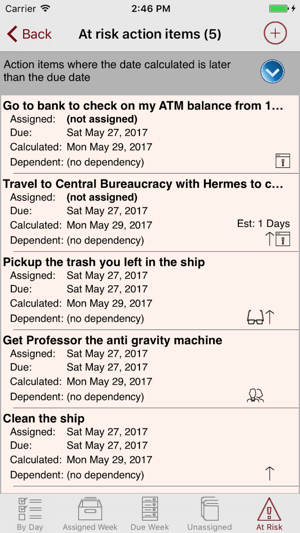 It also calculates the date each action item will be completed, based on the estimated work and dependency. Like project management software, this app can tell you when tasks are late, and at risk of being late. 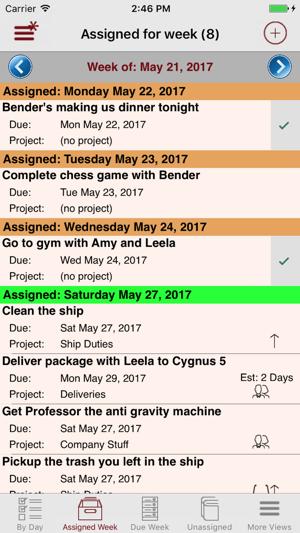 The app also gives you the ability to have unassigned tasks - work that needs to be done by a certain date, but you’ve not yet prioritized when to work on those tasks. team(Planner) understands that you are part of multiple teams and projects, and helps everyone to prioritize the work they need to do across all of their projects. team(Planner) makes team collaboration easy for small and large projects. You and your teams enter action items into the app and assign that work to different people. The whole team can see the action items for the project, including the progress being made, due dates for items, items that are past due where someone might need assistance, and dependencies between different action items in a project. Will you achieve your due dates? team(Planner) helps you manage to those dates by calculating completion dates based on assigned dates, duration and dependencies of your action items, letting you know when something will be done on time, or if it will be late, or if it is at risk of being late. 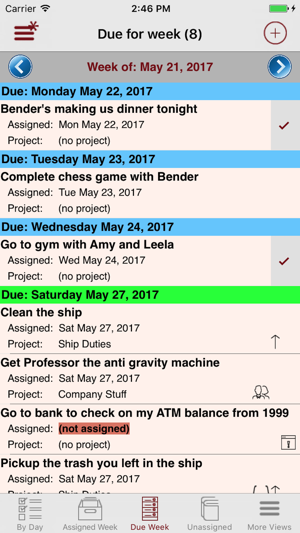 Like project management software, team(Planner) allows you to assign dependencies to tasks, telling the software that when one task ends, another task should then begin. 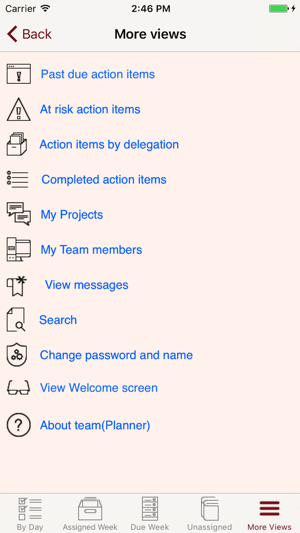 team(Planner) also takes project collaboration to a new level with Action item Notes - free form, unlimited note entries that team members can post to any action item in a project they are working on. Collaboration and ideas, together with the tasks they relate to, are all together in team(Planner), enabling you and team members to search and view task status across the project. Use team(Planner) to capture both the notes from a meeting, and the follow up action items that come out of that meeting, assigning that follow up work to the people responsible for completing it. team(Planner) also integrates with the Contacts and Calendar on your phone. Quickly create your list of team members in team(Planner) by using the Contacts on your phone. Do you have critical tasks that must be completed on a particular date? Have team(Planner) add those action items to your Calendar so you see them along side your other calendar entries and meetings. Let team(Planner) help you and your teams focus on the right work that needs to be done daily and weekly. Don’t get bogged down by endless to-do lists that stare you in the face every day. 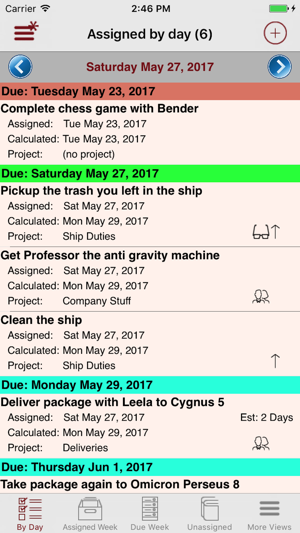 Don’t try to use a simple todo list app when your life and your projects are more complicated than just keeping a list. team(Planner) helps you to prioritize your days and weeks, allowing you to focus on the now, while still planning for tomorrow. Get the right stuff done, on time. Minor bug fixes, and added the ability to jump to your settings to change team(Planner) access to Calendars and Contacts. Now free until US Tax day April 15, 2019!